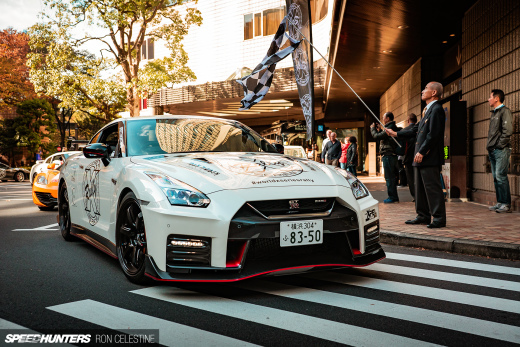 I'm winding down my Car Builder articles from my recent trip to Japan, and I hope you've been enjoying the insight into some of the smaller profile tuning houses. During my trip with the K-Tours crew, one of the garages we visited was T-Welding, also known as Technical Works. 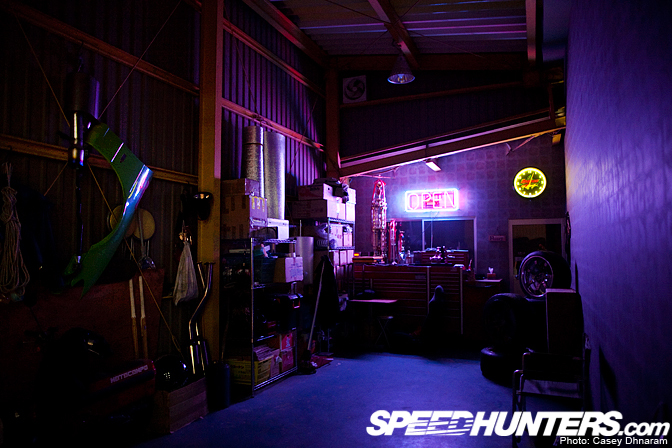 The shop is rUn by an older fellow by the name of Yuuichi Taguchi who has been around the scene for quite some time. 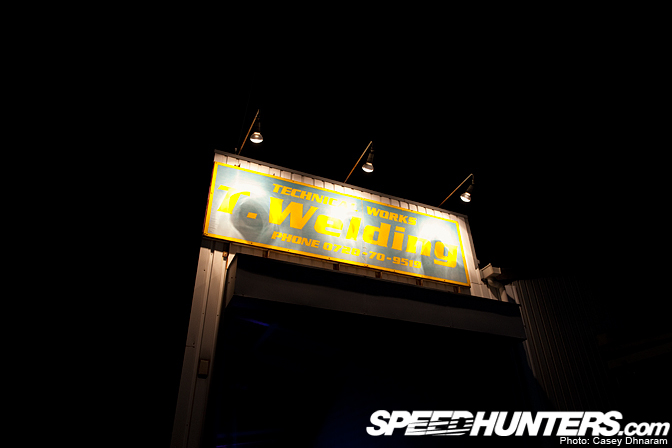 T-Welding specialises mainly in exhausts and, as their name suggests, take a lot of pride in their welding. Before we jump into the garage itself let's take a look at the parking lot out the front. This S15 was sitting on R34 GT-R wheels and was for sale at a surprisingly low price. 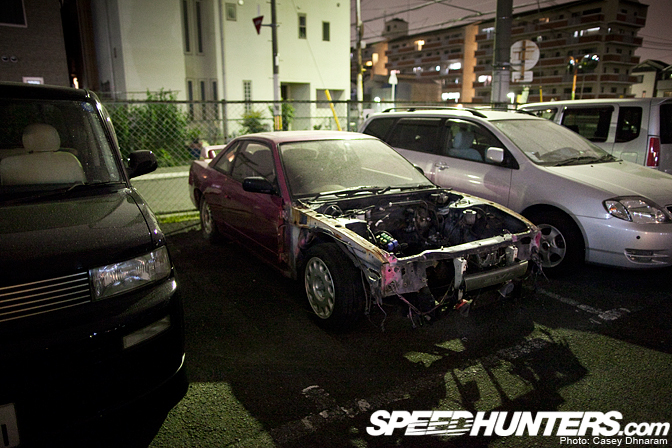 This sad looking PS13 used to be a frequent drifter until it got scrapped for another shell, looking inside there were many accessories and components still in perfect condition. 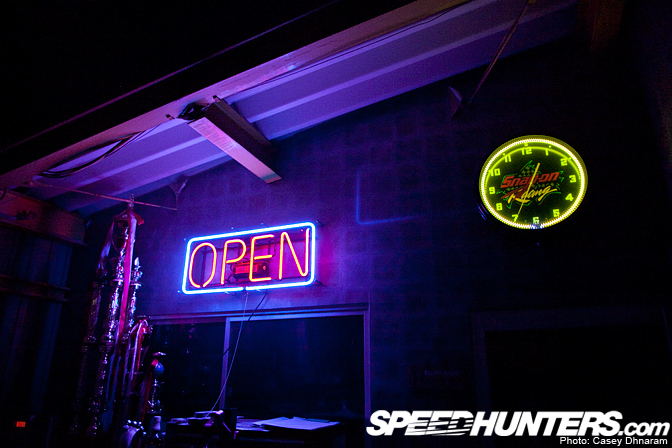 …such as the group of trophies on the left of the neon sign. 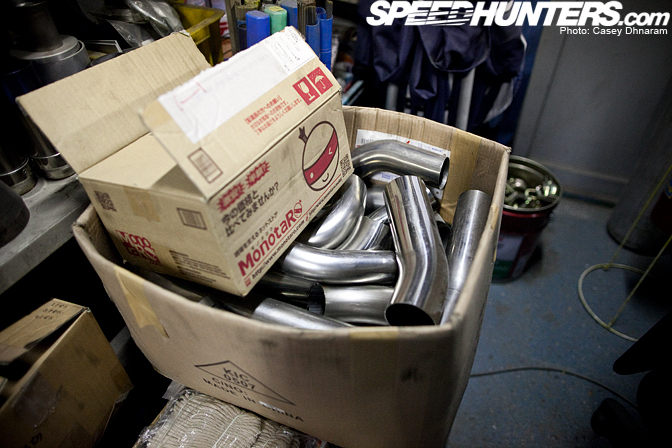 In the workshop I noticed a Toyota Type X was getting a custom exhaust system installed by the master himself – Taguchi-san. He happily invited us under the car to take a closer look at his work. …which completely blew my mind. 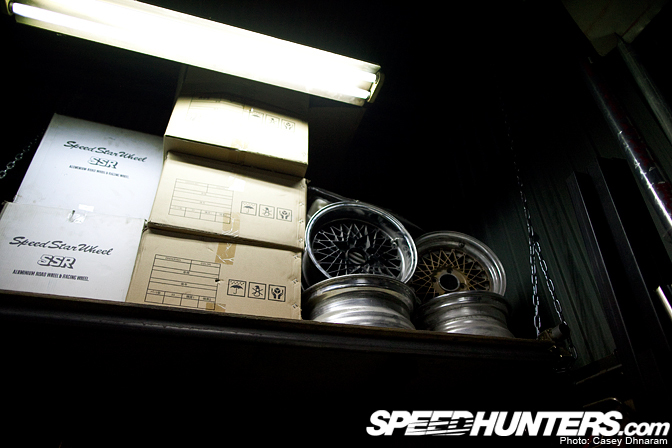 I noticed a number of boxes and wheels up on one of the shelves, including a couple pairs of SSR Mesh. A few of the boys were interested in purchasing some materials for their cars in Japan so Taguchi pulled out some boxes and showed us what he had in store. One box after the other. …With three tips on each side, with a perfectly angled cut. Even though it was late at night Taguchi lowered the Type X and started it to give us a taste of the Toyota's new note. To be honest, the only thing I can compare it to would be a Ferrari. It may sound a little over the top but it was actually hard to believe what I was hearing at the time! 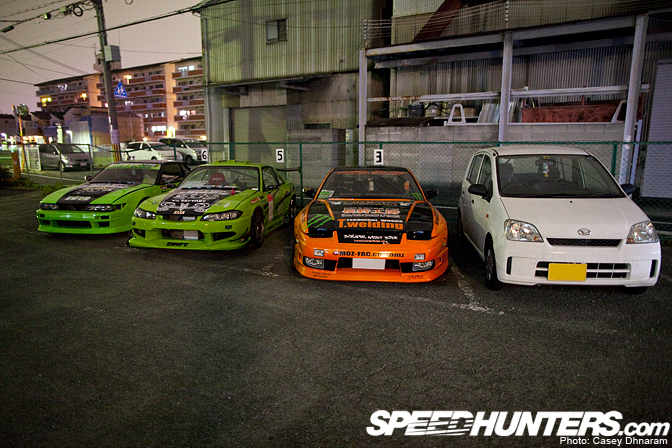 Just before we left we got one last view of the three S-chassis parked out the front which are all used for drifting. 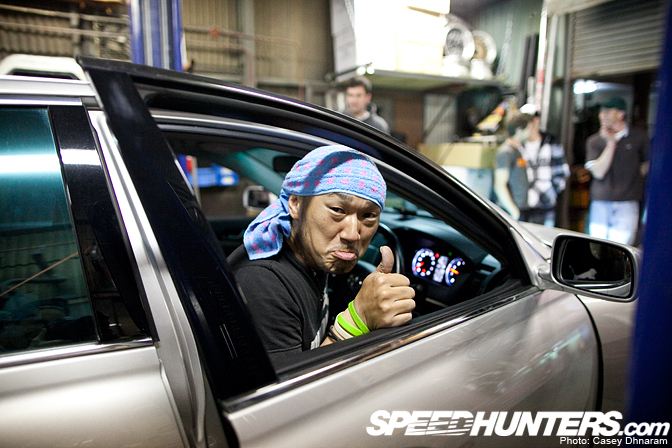 I'd like to thank Yuuichi Taguchi for allowing us to visit your garage, it was definitely a big dose of inspiration. Damn those welds look amazing, I would love to see some close up shots. Beutyful work. Where is the youtube clip? You got us all hyped up on this exhaust note and then nothing. Whats up with that? damn. those welds are a work of art. awesome! I wish you recorded a a sound clip of the X! omazing welding, but i seriously don't understand the use-10-pieces-to-make-a-ninety-degree-bend style. Why not mandrel bend a couple of 90's or even four 45's and then weld those together? 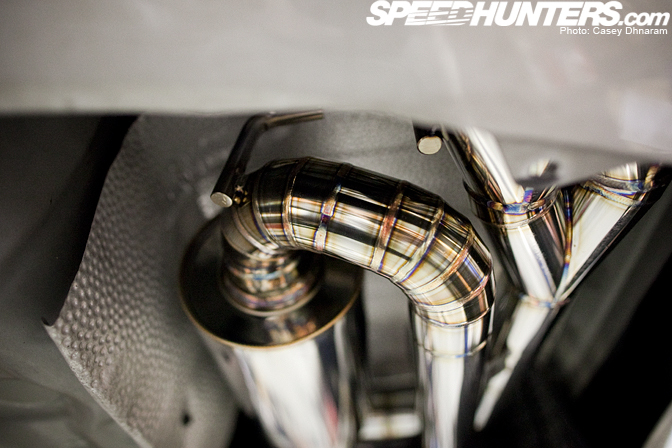 Now THAT, is an awesome looking exhaust! You don't have any pictures of the car from behind with the new exhaust do you? And a youtube clip or something would be great if you'd managed to get any footage. I would love to hear that custom exhaust, links or something c'mon!!!! 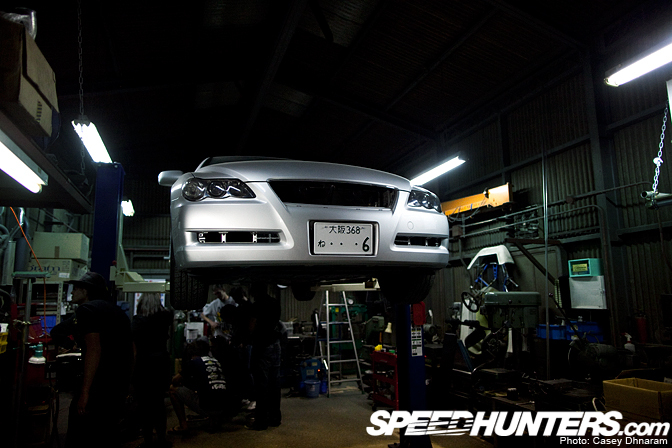 That's a Toyota *Mark X, not Type I think three tips on each side is a bit overkill but the quality looks damn good. good quality welding. if its Titanium we all know thats not easy to weld as steel is! 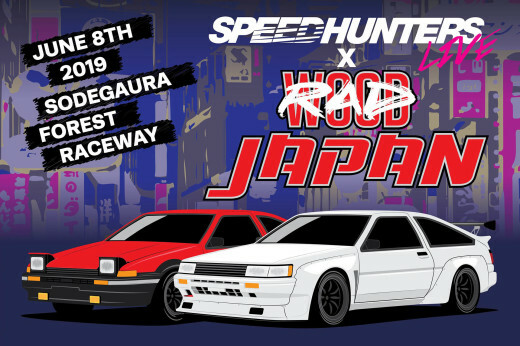 God I wish I lived in Japan! Next time, please record the exhaust note! Very nice welding...if that isnt car art I dont know what is. Sweet pics, but seriously Casey, lay off the info if you don't know what your talking about, it's becoming a very annoying trend with you. Not because everyone can have mandrel, its because u CANT mandrel titanium. 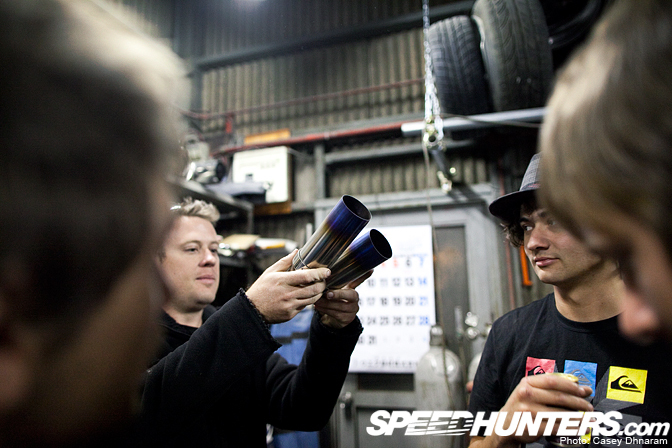 Cool shop and cars, but you got us all excited over the new exhaust sound and then... nothing. Anyways, awesome work, your words at the start of the story set some expectations , but damn! 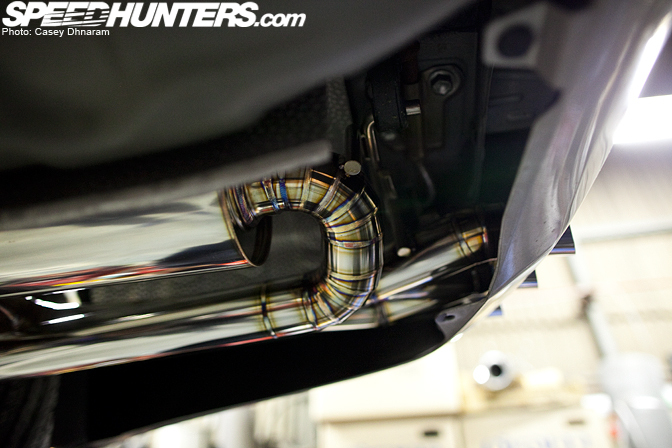 those are some awesome welds! Perfect, dare I say..
Stop hating kids.. this is basically a free online magazine you're getting, allowing you to see shops and features you otherwise wouldn't! Constructive criticism is one thing, but some some respect and gratitude wouldn't go astray.